Hello there, everyone! This Thursday is Valentine’s Day, and today’s puzzle is a cleverly disguised “box” of CANDY, where the names of different brands of candies line the edges of the grid (31D: [Box of _____ (Valentine’s Day gift suggested by the answers of this puzzle’s edges)]). Let’s take a trip around the candied trail, shall we?! MOUNDS (53D: [Pitchers stand on them]) – Are you an Almond Joy or Mounds person? (Can never get that commercial jingle [“Sometimes you feel like a nut…”] out of my head when coming across any of those bars. PAYDAY (1D: [Weekly check time]) – Best day of the week every time it comes around! 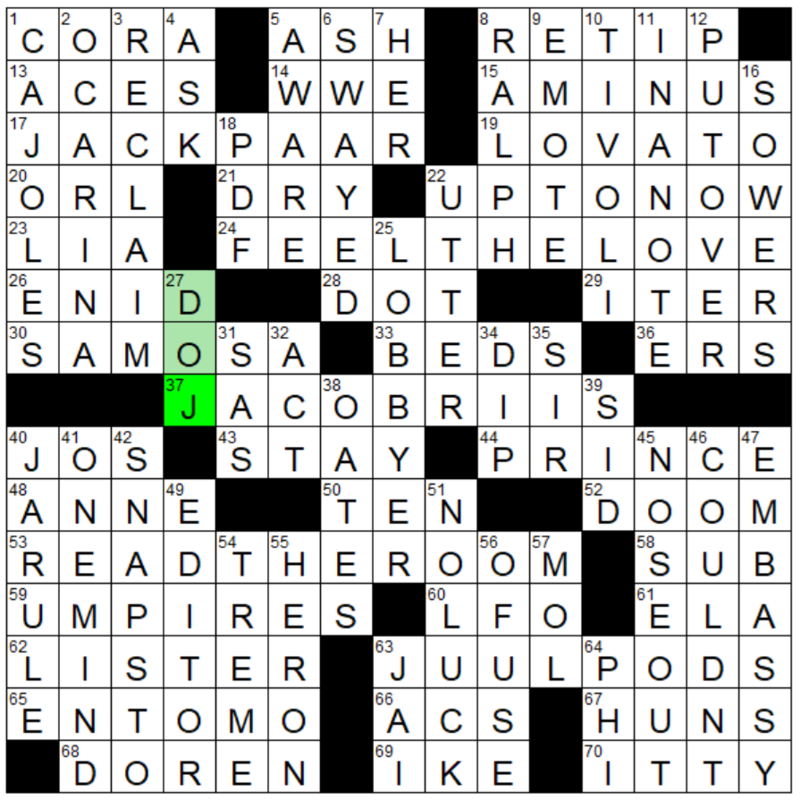 Everything was smooth sailing in terms of the solve until I ran into the clue for RESPIGHI, which, along with a couple of its crossings, made the southwest corner a complete spider’s web since I was not immediately familiar with the name of the Italian composer (39D: [“Pines of Rome” composer]). Running through the alphabet finally made something appear that looked recognizable and that I was comfortable with putting in. I can totally see some beginning solvers having a devil of a time successfully navigating that entry, especially when it crosses HAE (43A: [Own, in Dundee]) and ECHO PARK, an entry I knew only because I’ve been to Dodger Stadium before and remembered that an Echo Park section of the city was adjacent to the stadium (68A: [2006 Michael Connolly novel that’s also the name of a Los Angeles neighborhood]). Yes, that is another case of sports, at least indirectly, bailing me out of a spot of bother. There were a few sweets that did not make the cut as part of the theme but still featured in the grid, like AMARETTI (18A: [Italian almond cookies]) and TUTTI (20A: [___-Frutti]). Loved the fill of both LOG CABIN (63A: [Humble birthplace of 67-Down]), in reference to ABE (67D: [Honest “prez”]), and OPEN FIRE, and even better that those two entries intersected (41D: [Chestnut-roasting place in a popular yule tune]). Definitely would not mind standing next to an open fire at the moment since temps here are still hovering around freezing out East. Thank you so much for the time, everybody Have a wonderful rest of your day and, as always, keep solving!! 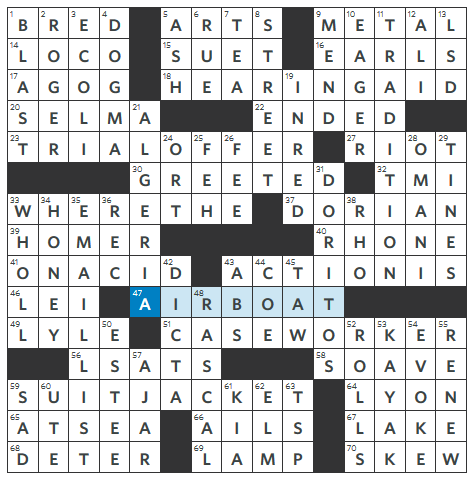 Let’s see what it is about today’s puzzle is “Legally Binding” (aside from the fact that we probably agreed to some kind of arbitration clause just by clicking through to the puzzle on the WSJ’s website!). 23A: TRIAL OFFER [*Telemarketer’s come-on] – Doesn’t “come-on” largely have a pick up line at a bar connotation these days? I … don’t get it? Certainly, a HEARING, TRIAL, CASE, or SUIT can be carried out in court, but I don’t get the connection to the revealer. I feel like I’m being super dense. Is the theme just that you can take an action in court and these are four actions you can take in court? I’m not a legal-minded person, so maybe taking an action in court is more of an official term? Otherwise, it seems a bit arbitrary. Also, WHERE THE ACTION IS implies a courtroom. So, if the revealer is hinting to that location, shouldn’t the themers be synonyms of courtroom (to line up with WHERE THE), not synonyms of the actions taken in the courtroom? Something is incongruous about this theme to me. Help me out in the comments, please, if I’m missing something obvious. – I’m glad to see SELMA get a mention as the [Site of a 1965 voter registration drive]. What an important time and place in history! – How was a connection not made in the cluing between LSD and ON ACID? I did appreciate the [Bayou craft] AIR BOAT + [River craft] KAYAK nods to each other. – I was pleased that ROGER and HOMER were both clued not with respect to men, but to other uses of the words! However, is the only woman in the grid really an unnamed [“The woman ___” (Gene Wilder film)] IN RED from the man-trying-oh-so-hard-to-commit-adultery movie? Oh wait, there’s ESTEE Lauder, always there to save the day. – Who says FEH? SOAVE? DICTA? COE? TAW? FEH, indeed. Great theme! Assorted words (and one phrase) are parsed as if they’re a 2-letter state abbreviation + another word. 17a. [Psychedelic stuff from the Evergreen State? ], WA SHROOMS. The Evergreen State is Washington. 26a. [Underwear from the First State? ], DE BRIEFS. Delaware. 28a. [Gambler’s action in the Cornhusker State? ], NE WAGER. Nebraska, with New Ager being the only two-word basis for a themer. 40a. [Forest animal in the state nicknamed Old Dominion? ], VA MOOSE. Virginia. 49a. [Mosquito from the state nicknamed Land of Opportunity? ], AR BITER. Arkansas. 51a. [Highway divider in the Centennial State? ], CO MEDIAN. Colorado. 64a. [Pasta from the Golden State? ], CA NOODLES. California. Fave fill: SCHMEAR of cream cheese, “SEE IF I CARE,” SCREENSHOT, ECHOLOCATE, WELCOME MAT, VENDETTA, and ZIPPY. 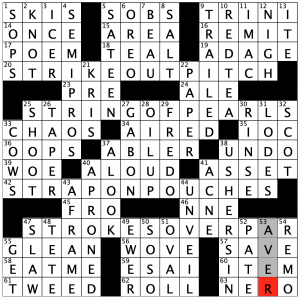 The worst stuff in the grid is the bits that won’t come readily to mind for a newer solver—your YSER river, ACER clued as a [Tennis serving whiz], the non-major hockey league AHL, Mount ETNA, ASCAP, -INI, SSNS, maybe MEWL. Four stars from me, despite that YSER business. Is it time for a Jonesin’ puzzle already? These days are flying by. I must be getting old! I can never get a timer to work with these. I was using Xword on my new Surface Laptop 2 I got for work, and the timer wasn’t set up. 6 minutes maybe, if I had to guess? We have double vowels in our theme answers, one for each vowel, and in order! Neatly done. And 63A is timely, as they are trying to slow down the rise in teen vaping. Here in Indiana, there are TONS of smokers. I simply don’t understand it. For some reason, people think it makes them look cool. I will stop talking before I offend someone. Great puzzle, Matt! 4.4 stars this week. 1A [“Downton Abbey” countess] – CORA – I have not ever seen this show. Is it done now? Better yet, when will it be on Netflix? 19A [“Sorry Not Sorry” singer Demi] – LOVATO – It makes me think drug penalties have different rules when you hear about many people in jail for minor drug possession, but when this singer has a massive cocaine relapse it is all “Aw, poor thing!” on the news and adoration from her fans. Why is there no penalty for her?? 65A [Prefix meaning “insect”] – ENTOMO – This is not great. At all! 2D [Instrument in a Legend of Zelda title] – OCARINA – The Legend of Zelda: Ocarina of Time is the full title of this game. 10D [Copenhagen’s ___ Gardens] – TIVOLI – I have actually been here! 11D [How short messages may be sent] – IN A NOTE – I wrote IN A TEXT. It is also true! 40D [Rapper in the Fyre Festival documentaries] – JA RULE – I am watching parts of this. It is like watching a car wreck. 57D [Actress Gretchen of “Boardwalk Empire”] – MOL – Has this actress gained crossword fame yet? 63D [“___ Ho” (“Slumdog Millionaire” song)] – JAI -This song actually won the Oscar for Best Original Song. See you for next week’s Jonesin’! This one took a shade longer than it should have. I need a vacation. Why isn’t 1D some sort of revealer? Am I missing something? 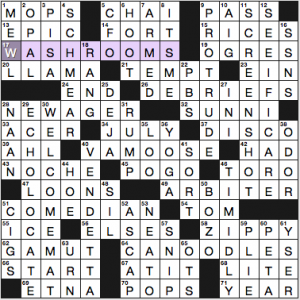 1D [Soaks (up)] – SOPS – Foreshadowing? So, since each of these themers has the initials SOP, you would think that, in prime LAT fashion, there would be a revealer. I am thinking that 1D is not a mistake, but a more clever clue would have possibly tied this puzzle up in a slightly neater bow. Something like [… and a hint to what is happening in this puzzle?] would have been nice. Or maybe I am just getting used to theme revealers! Still a fine puzzle, which, as stated, I found a tad tougher than a normal Tuesday. But again, I need a vacation. 4.3 stars. 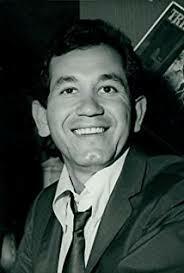 9A [“If I Had a Hammer” singer Lopez] – TRINI – This singer is definitely crossword famous; I am not sure I could pick him out of a police lineup. As a matter of fact, I didn’t know if this was a man or a woman for the longest time! Here is what he looks like! 35A [Summer Games org.] – IOC – It seems like a shame for an athlete to train for years to qualify for the Olympics, and then have one fall or a bad judge ruin the whole experience. No guts no glory, I suppose! 46A [22.5 deg.] – NNE – Does anyone know these degrees by heart? 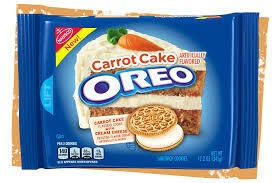 6D [Layered Nabisco treat] – OREO – My wife just bought me the carrot cake flavored ones! 21D [Songwriter Kristofferson] – KRIS – He was in the version of A Star Is Born that I remember. Now there are at least four versions of this movie I have never seen. Perhaps I will start with the 1937 edition! 47D [Side with a sandwich] – SLAW – I have carped on this before – why can’t SLAW just be a cabbage dish? Don’t decide for me what I eat it with. 54D [San __, Italy] – REMO – This is in extreme NW Italy, and when I see it on Google Maps it is one word. At least the town is. I have never been to Italy! 55D [“__ it?”: “Comprende?”] – GET – We are using Spanish to explain English! I love it! There is freezing rain here in northern IN this Tuesday morning. What fun! 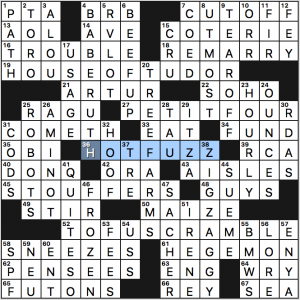 36a [*2007 buddy cop film] HOT FUZZ–This is a fun answer. I missed this film. 45a [*TV dinner brand] STOUFFER’S–It’s a shame they couldn’t find another ILSA for this one. 52a [Vegan breakfast option, or a hint to four letters in each starred answer] TOFU SCRAMBLE–I’ve never had tofu scramble. This entry was posted in Daily Puzzles and tagged Andrew Zhou, Elizabeth C. Gorski, Gary Cee, Matt Jones, Roland Huget, Tom Pepper. Bookmark the permalink. 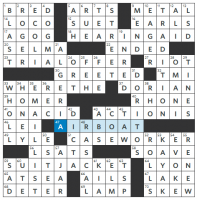 Isn’t the computer manufacturer ACER wide enough known now to serve as a better basis for a clue than the concocted only-in-crosswords tennis server? My exact thought. No one ever says ACER about tennis. Very odd. An editorial oversight, maybe? Also, re 51D, an avocado’s shape is OVAL only in Flatland. The first three letters of each theme answer is STR so maybe the them is STROP instead of SOP. WSJ: I, too, don’t get it. Sorry Nate. I also came here to find out what I missed. Nate was on the right track. Think legal action, which is what takes place in a HEARING, TRIAL, CASE, or SUIT. I found this a really entertaining puzzle. I did give a little side-eye to FEH, but I think SOAVE, DICTA, COE and TAW are all perfectly fine words. COE College, in particular, regularly ranks in the top tier of small US colleges, and is certainly fair game for crosswords. A great Tuesday puzzle! NYT was fun. I’d question “chops finely” as the clue for rices. Dicing is chopping. To rice, you need to put something through a ricer (potatoes, for example). You don’t chop to rice. I thought this was deliberately misleading in addition to being incorrect. I didn’t consider it incorrect because a potato ricer is not the only way to rice something. Riced cauliflower, for instance, is the new quinoa. Although I hope its 15 minutes of culinary stardom are over soon, it is illustrative. Ricing is about the result, an ingredient reduced particles the diameter of rice grains, and not about the mechanism. I readily admit potatoes put through a ricer is the most common example, but it’s not the definition. BTW, potatoes should always be riced before mashing. Not for those of us who like them lumpy. Basically, an action can include a hearing, trial, case, and/or (law)suit, so it refers to all of the other themers. I do agree that “where” implies some connection to the court room rather just law in general, though. 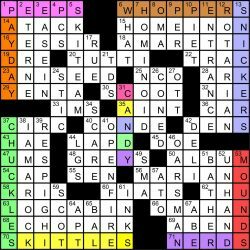 The Xword Nation puzzle was a lot of fun! I didn’t recognize Chuckles candy but all the others were familiar. Re: ECHO PARK, don’t know anything about the actual place but I’m always reminded of the lyrics for Carmelita. The Linda Rondstadt version is the one I remember. Re: LAT, the easiest way to understand the relationship of degrees to directions is to Google “compass rose”. The only thing to “know by heart” is that north is zero, and degrees increase clockwise. Any quadrant has ninety degrees, and quarters of that are about as fine as it gets cut.